The art, the cosmos, of writing—this is where language (the 2018 Classical Conversations Practicum theme), rhetoric (the third art of the trivium), and community (the third “C” of “Classical Christian Community”) all come together. Rhetoric (speaking, writing, creating, communicating) is incarnational, an embodied idea. Rhetoric is an art of the trivium. We participate in the Imago Dei through these human activities. Rhetoric is an art we practice in community with others. How does the art of rhetoric apply to the writing component (IEW) of Essentials? And how does it create a bridge to the Challenge program? ** IEW prepares students for Challenge by introducing them to structure and style. Challenge students move on to LTW, but they will use their IEW research essay skills for their many science papers in Challenge A and B as well as the story sequence skills for their short story in Challenge B. 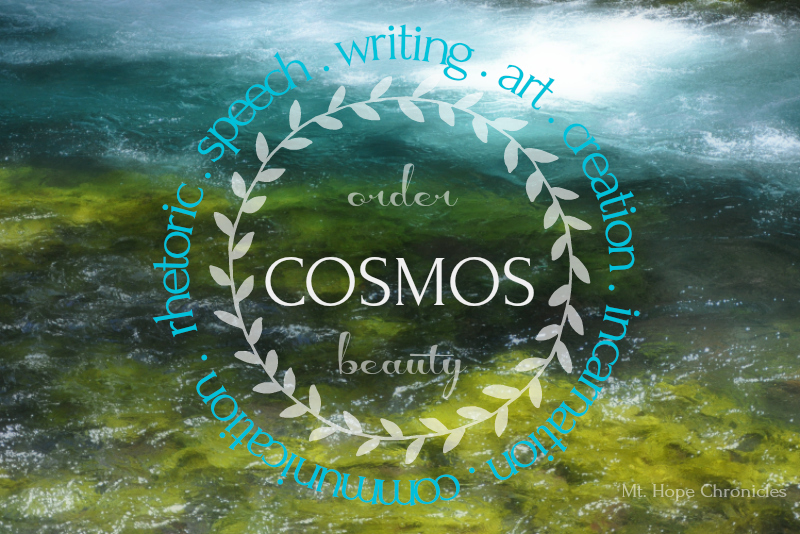 Order + Beauty = COSMOS! Thank you for these posts. Keep 'em coming!